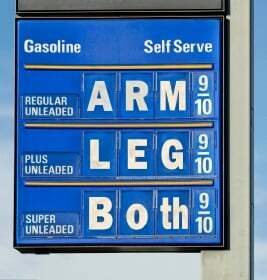 Like most Americans, you’re probably fed up with fuel prices. And unfortunately, unless you own a pure electric car or don’t own a car at all, then you too are a victim of price gouging. Spending a nice size chunk of change at the fuel pump seems to be unavoidable these days, but there are subtle ways to cut cost. Following are a few simple tips to follow even if it only saves a few cents here and there; but the long term savings can add up. If you have multiple errands to run, know your route ahead of time. If you can hit stops that are on the way to your last planned destination, then you won’t be wasting gas on backtracking. Let’s say you live just around the corner from a convenient store. Instead of hopping in the car to drive a block, take a bicycle or your own two legs. This method keeps us from taking a needless drive and also is good for our bodies. The point being, if you’re close to your destination, avoid being lazy and rely on foot power. Next, if you must get gas, aim for a fill-up day that is an off-peak day. That is to say, if you can help it, get gas on a Tuesday or Thursday. Research shows that these two days of the week tend to have lower fuel prices than any other day of the week. Also, try and fuel up in the morning hours; what was cheap this morning could change drastically by afternoon. Avoid getting gas on or near a holiday. Fuel giants know when travel trends pick up, and their prices will jack up because of it. Another piece of advice… Carry in your trunk two to three 5-gallon fuel cans. Regulation cans may be purchased most anywhere car accessories are sold. By having these babies handy, should you run into a gas station with low to reasonable prices, fill up the spare cans, and then use them for when prices skyrocket again. Having these cans is also handy if you’re planning a long road trip. Yet another tip I can give you is making use of gas stations that are part of a bigger superstore. Costco and Giant Eagle are just two superstores that offer this convenience. Costco, a bulk superstore, requires membership, and therefore is able to offer lower fuel prices than competition. Giant Eagle, a mega-grocery store, yields discounts with something they call Fuel Perks. In essence, you buy groceries and earn cents off per gallon of gas. You have to shop for food anyway, why not get the benefit of lower fuel cost to go along with it. And finally, keep an eye on your tire pressure and know how old your air filter is. Low tire pressure and/or dirty air filter robs your vehicle of gas mileage. By keeping both in proper inflation and cleanliness respectively, you can up your miles per gallon. So there you have it. We can’t avoid filling up our cars and trucks when they need it, but with a little preparation, we can at least cut some of the cost. Happy motoring!